As you can see there's a new dog on the line. Our Milwaukee Special now has a big brother, the Hiawatha! When it's running either lead, follow or get out of the way because the Hiawatha is not going to be delayed for anything. 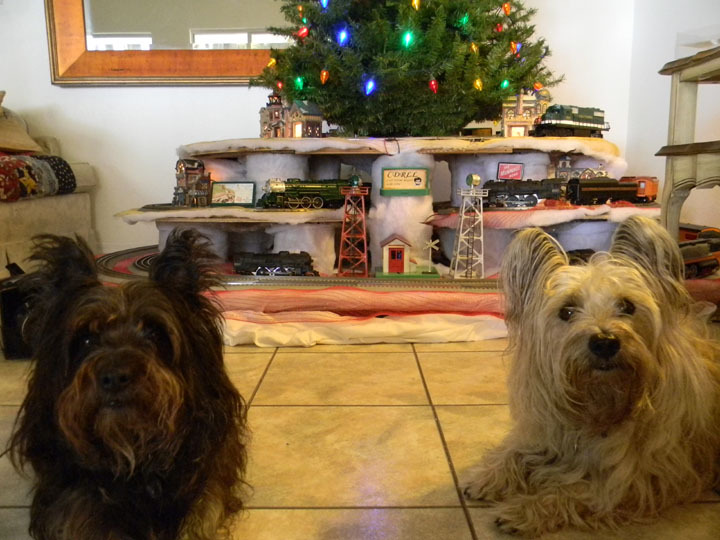 When we decided we wanted to have a more permanent train display we thought to base it on the Christmas display of 2012. 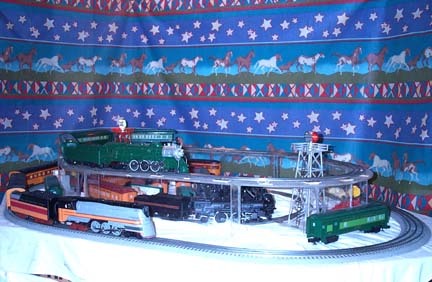 Initially it was going to be a modular display that could be dismantled easily and moved to the living room for next Christmas. As work progressed this idea kind of fell away. Now the thinking is just getting the the table built so we can run trains will inspire us to continue improvements. The first phase of construction was the bench work. We wanted something mobile that could be rolled around to allow access to the closets and move over obstacles such as end tables and night stands. What we came up with is 86" X 50" or approximately 7' X 4' table built on a foundation of 14 ball casters. To keep the weight down and make it easier to move we used 1/4" plywood reinforced with 1x2's supported by Folgers Coffee canisters on the two upper tiers. A side from cotton batting we also incorporated foam pipe insulation for sound suppression. 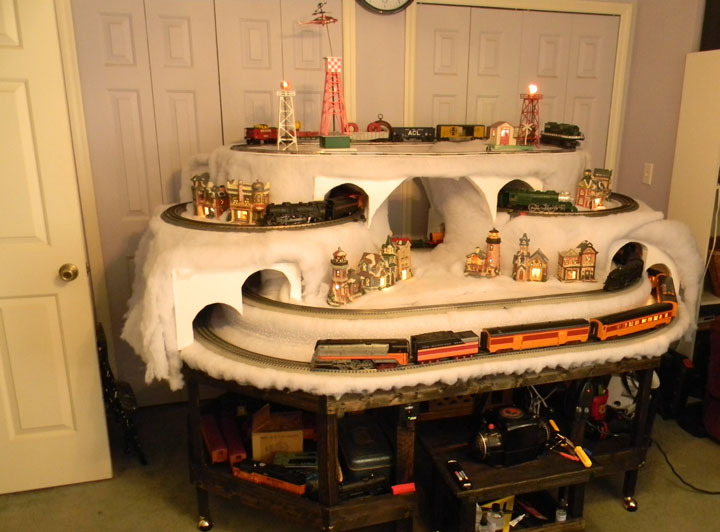 The final display gave us a four tiered layout with five loops, twelve tunnel portals and plenty of room for accessories, coming in at just over 4' x' 7' and 55" high. It's difficult to see from these views but there are two bridges on the top tier. Above is the view from lying in bed. Because of the mobile transformer table all the controls can be moved within arms reach while comfortably having breakfast and coffee in the morning. Merry Christmas & happy New Year Everyone! This years Christmas train was a bit of a challenge given the necessity to down size so we could accommodate some special needs. Mom recently went through a hip replacement and we needed to allow more open space for her walker. 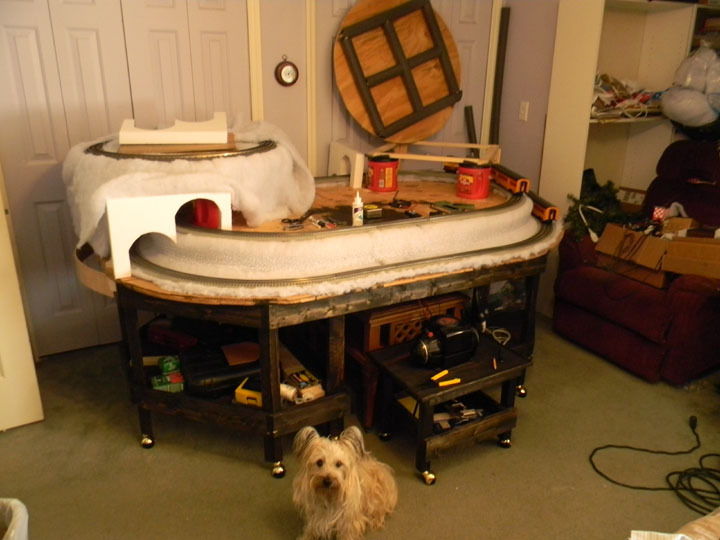 We decided two simple circles of O 31 RealTrax on a 46" X 34" platform would be about the limit of the layout. 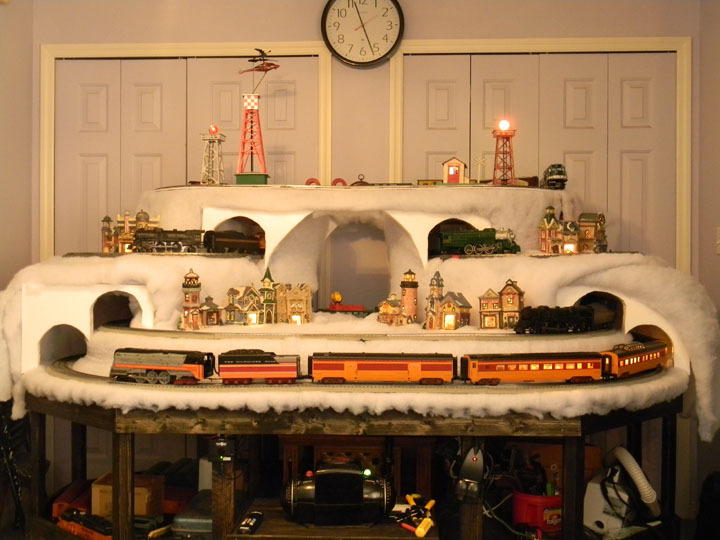 We incorporated our KW Transformer to operate the Lionel MPC era Milwaukee Special on the openupper level and Southern Crescent on the lower level with a tunnel. It turned out to be very satisfying and enjoyable setup. 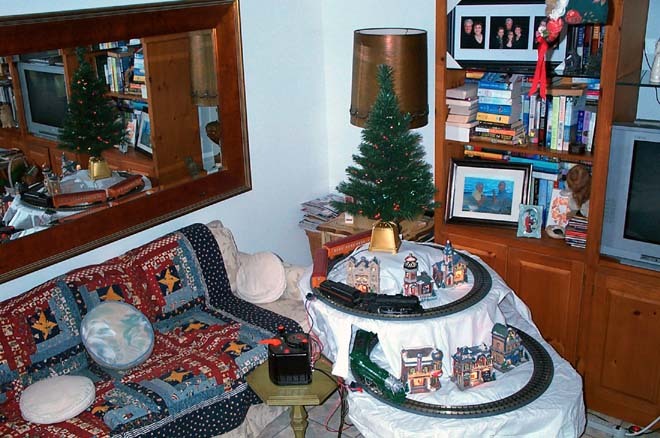 Though not as extravagant as years past the experience of having a Christmas Tree lit up above the trains is a tradition that can never be beat no matter how simple the lay out. We Wish You All A Merry Christmas And Very Prosperous New Year! Cheesy Fall's Fire Fighters have their priorities and the Federal Government isn't among them. Though an arsonist struck the 1RS office building in the Village early Saturday morning the local Fire Fighters didn't allow that to deter them from continuing to fill the local ice rink. When asked if putting out the nearby fire wasn't more important than filling the ice rink. Fire Fighter Sydney Piker replied "Are You Kidding, we're here for the children! Look at the faces of these kids, they wait all year for this event and we don't intend to disappoint them. I'm sure if we went over to tend that fire the media would be all over us for disregarding the needs of the children." Besides property values in the Village have been tanking ever since they built that building, letting it burn is sure to reverse that trend." While the National Media blames conservative talk radio hosts for encouraging the arsonist whom set the 1RS office building a blaze Saturday morning, local residents have different ideas. 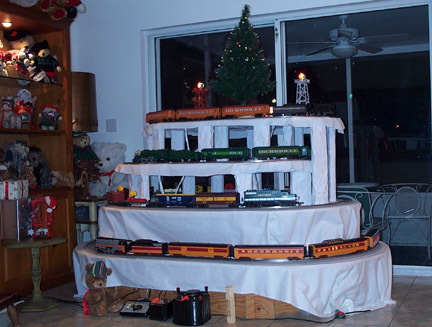 They're planning a tribute to Model Railroad entrepreneur Mike Wolf, who is being credited for doing more than any other person in the Country to turn the trend of a plunging real estate market in the Village of Cheesy Falls. Though no evidence supports the belief, the citizens of Cheesy Falls think Mr. Wolf is the man behind a T@x Revolt movement which they say was the inspiration that triggered the arsonist to act. Since the 1RS stated it had no plans to reoccupy the property Saturday afternoon the Village's Chamber of Commerce and local real estate offices have been bombarded with calls from small businesses and individuals asking about availability of vacant properties. Immediately after the arson fire, the 1RS announced it had no plans to rebuild the structure and instead were looking to relocate to the former Dewey, Cheatum & Howe building in the nearby town of Apathetic. 1RS Officials say the town is perfect place for their operations as the residents all share a philosophy they like to see in their clients. The move is expected to be quick and efficient because there is no need for modifications to the new location. Even the existing signage is suitable for their operations, which is expected to save Tax Payers 2.3 Trillion Dollars. 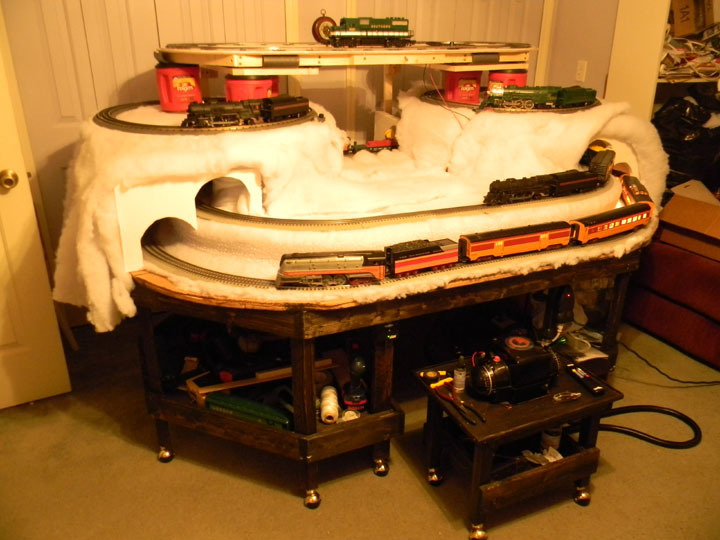 The 2009 Christmas Season is here and with it comes a new layout for us to enjoy all year long. As you can see it consists of four separate loops stacked on top of each other, so we'll be able to run a variety of trains simultaneously. The top two tiers are small O27 loops. The second tier is O36 and the bottom tier is O48. You can see all the way through the second and third tiers. We covered the bottom of the top two levels with white packing paper. This promotes reflection from the different illuminated cars as they roll around the layout creating a magnificent light show. We also experimented with with some noise dampening techniques by sandwiching the sheets of plywood between layers of double wall corrugated cardboard. A bonus in using the corrugated material was being able to bank the turns on the O27 track without using individual shims, which lessons the chances of derailments. I didn't believe three mainlines would fit on a70" X 48" layout. One evening while browsing Choo Choo Auctions I noticed an auction for a Milwaukee Special set that was about to close with no bids. Just what we needed another Milwaukee Special. On a lark I placed the minimum bid and won the set. It came with some unused O 27 track. So for kicks I checked to see if it would fit on the existing layout. The tolerances were pretty tight but it fit. 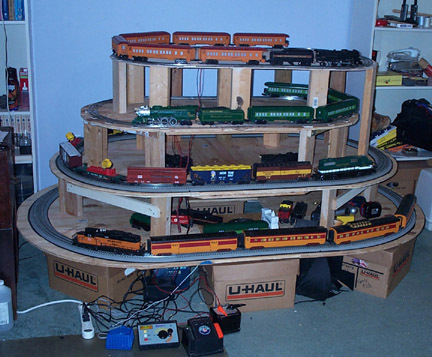 That's why we now call the inside loop on our layout the "Accidental Railroad." It's a lot of fun running three trains at a time on a small layout. You can see how the "Accidental Railroad" fits in with the other rail lines by viewing this video. Click on the pictures above for a larger view. We've been looking forward to adding the Milwaukee Road Hiawatha to our line up. Thanks to Jim Sutter at Jim's Train Shop in Homer City, Pennsylvania and his excellent prices we were able to make the acquisition possible. Our new 4/8/4 Hudson Hiawatha passenger train is a model of the train that took Carl Dovis Rogers Jr. and his new bride on their honeymoon. The day after they were married they departed Chicago for the Wisconsin Dells on the "Morning Hiawatha" June 15, 1946. This train also compliments our genealogy studies in that Carl Dovis Rogers spent most of his career with the railroads working for the Milwaukee Road until he retired. The F7 4/8/4 Hudson, Hiawatha was one of the last steam locomotives put into service. It broke many speed records and set the standard for luxury in rail travel. You can see the transition from the Milwaukee Special to the Hiawatha by clicking here. Click here to see some of the unique features of the new Hiawatha. You can also watch the train running at night. Were slowly shaking away the Cheesy System. As you can see we've added some ground cover and acquired a new freight line. The Southern Railway is merging with the Milwaukee Road. Dad retired from the Milwaukee Road and his Father retired from the Southern. 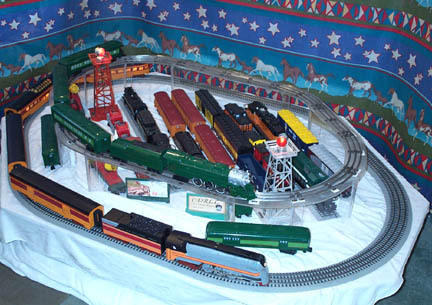 Because they both shared the same name we are now introducing our new Rail Company the "Carl Dovis Rogers Life Line" or "CDRLL"
As you can see because of our new acquisition the rail yard in the middle of the layout is getting pretty full. 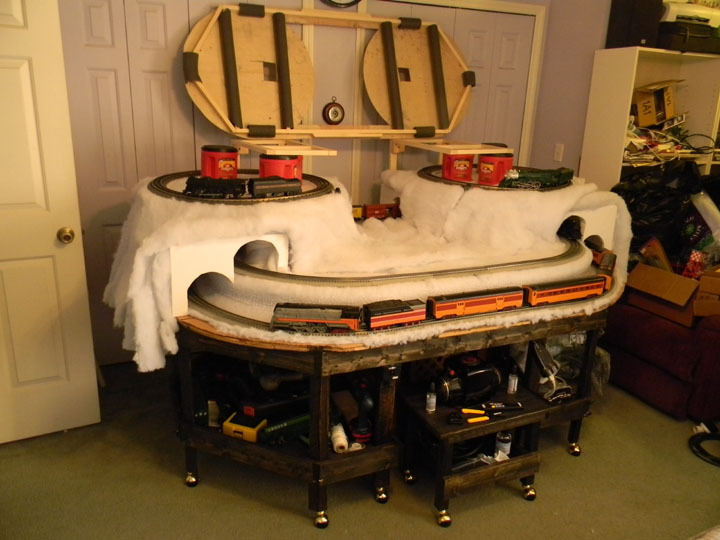 It will soon be over flowing with Motor Power and rolling stock once all the equipment arrives. We're going to spend the next few months working on purchasing more space and road bed to accommodate the new merger. The searchlight cars the Southern Freight brought along to the merger really helps highlight the upper mainline and Milwaukee Special that runs along it. This new merger hasn't been without its problems. Partisan fighting between the two Railroads over jobs, yard space, rail lines and power sources have been our main focus of late and have been preventing us from moving forward in the transition. To settle these arguments the CDRLL held the “Great Train Race!” At stake were the final decisions to all the arguments that have been blocking our movement forward. 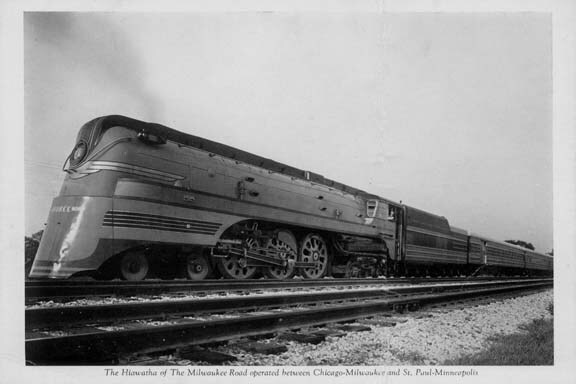 The Milwaukee Road’s “Milwaukee Special” faced off against the Southern Railway’s “Crescent Limited”. It was an exciting event hosted by the late Buck Owens and George Jones. We've posted the video here Missing from the video is the little guy in this picture Trying to hold the Southern Crescent back in its second go around the track. You can view this new layout in action running at night and running during the day. You can click on the pictures above for a larger view. The Cheesy System is proud to announce we've placed the new mainline for our Milwaukee Special on a pedestal of Ice. This isn't an easy thing to maintain in Central Florida, but thanks to new breakthroughs in acrylics the rail line is relatively trouble free. The roadbed was cut from a sheet of acrylic 1/4" thick. The six sections of trestle consist of various lengths of 1/8' acrylic 6" high with 2" wide supports clued at each end to form a "Z" configuration. This system is very sturdy with absolutely no sway or sagging. 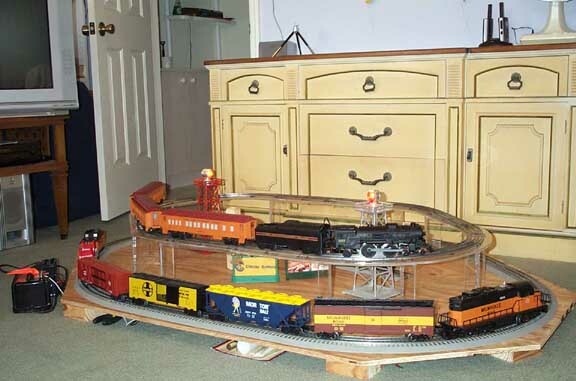 Because of the small size of the layout 69" X 48, acrylic is an excellent choice for the trestle system. There's limited visual obstruction to the rest of the layout. The reflective qualities of the material makes up for the lack of accessories with constantly changing light show. Other additions to the layout include the raising of the lower level with some stubs of 2 X 4s allowing the wires to be easily fed under the layout to the transformers. It also provides storage for track cleaning supplies and tools. 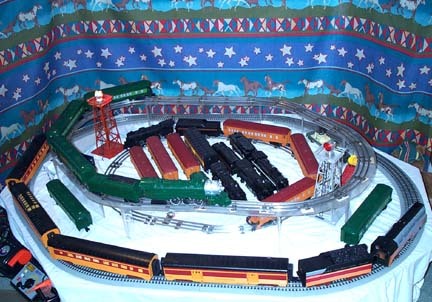 We also added two Lionel rotating beacons and a Lionel 1033 transformer. And of course the Cheesy System billboard with our mascot Cheesy munching on some cheese in the center of the big "C". As you can see we've retired Mt. Heston. 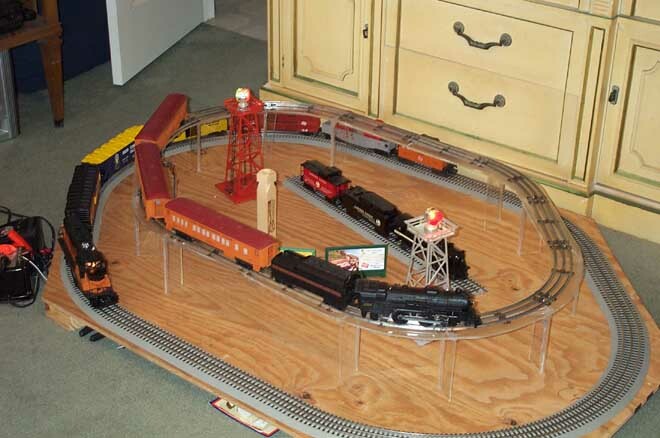 But still retain the air whistle in the center of the layout for our freight operations. 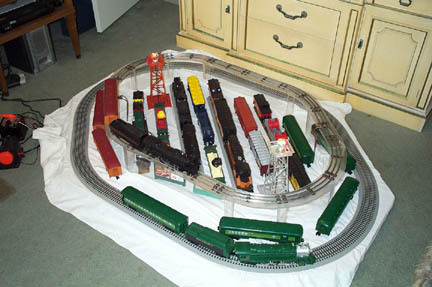 I’m proudly sharing my first model train layout with y’all. The Cheesy System is a lesson in efficiency measuring 48” X 69”. Notice the stretegery I used to provide access to the bathroom and underwear drawer by cutting out the corners of the layout. My Milwaukee Road SD18 doesn't have a horn so I improvise with air whistle seen standing in the center of the track next to the Hiawatha billboard. Some people may think the whistle isn't appropriate for a diesel but I don't care these are after all toy trains. I was preparing to lay down the new mainline of a O27 track to accommodate my Milwaukee Special the evening it arrived when the power went out. Luckily my battery operated billboard provided enough light to find a flashlight. With a few cordless tools, I was still able to put down the track and thirty minutes later when the power returned we were ready to run. 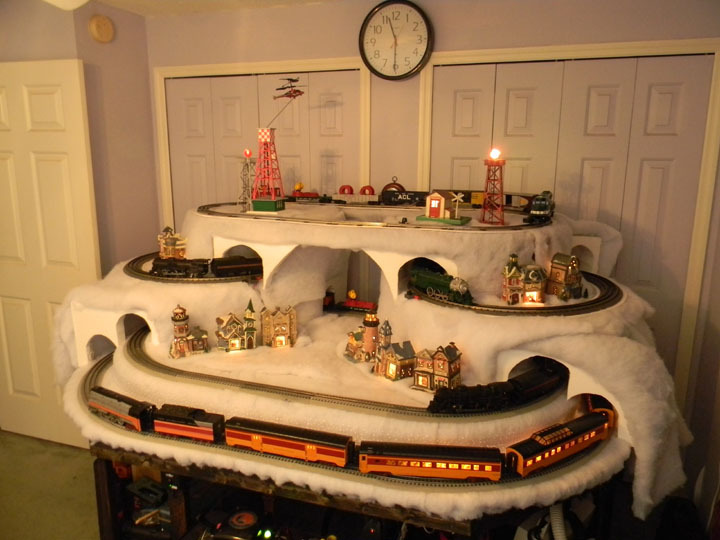 When I decided I'd add a mountain to the layout it took fifteen seconds to pull the Charlton Heston kite off the wall and lean it against the dresser. If I ever decide to put a tunnel through Mt. Heston, I figure it will take about five seconds to lean it over the track. I love the "Cheesy System" alterations are fast and easy leaving more time for operations. Now you can see the Cheesy System in Action! 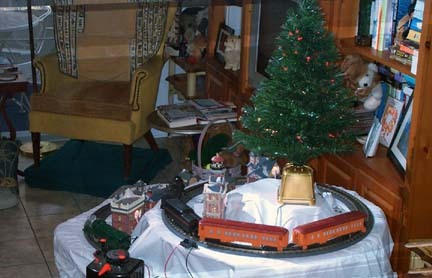 This was our 2008 Christmas layout. 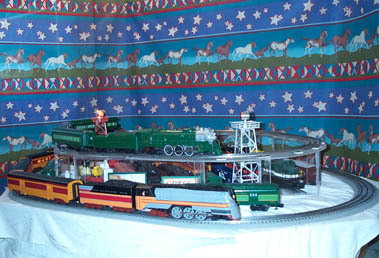 The top tier is the G gauge Snowden Christmas set from 1997. 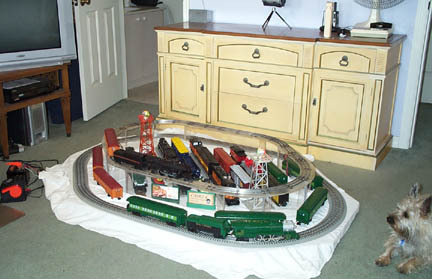 The middle tier is G Gauge Southern Steam set. 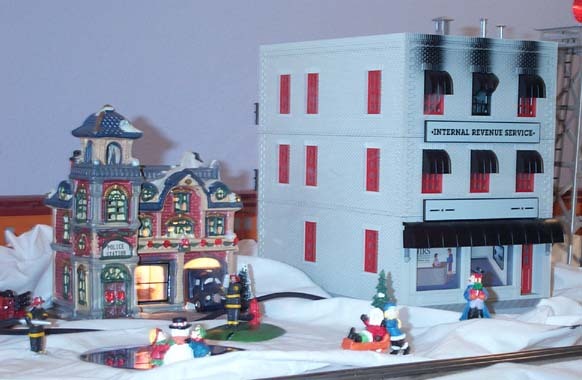 Both of these sets are battery operated, The Southern set is remote control. 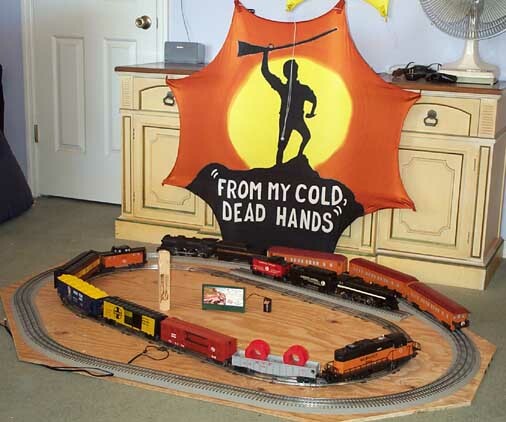 On the floor is the debut of our Lionel O Gauge Milwaukee Road consist SD 18. 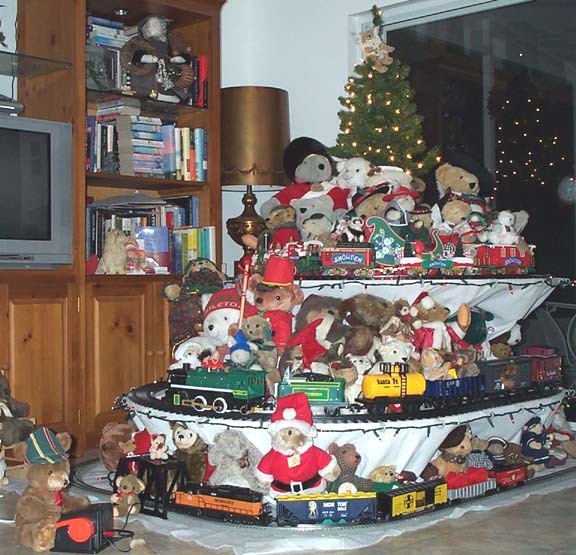 Mom's Teddy Bear Collection fills up the inside of the loops.